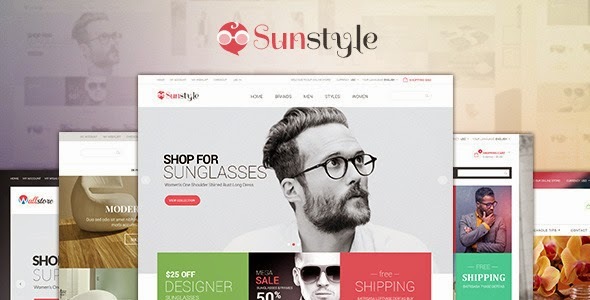 Venus Sun Style Store is a Responsive / Multiple Purpose Magento Template suitable for any kind of Fashion Shop, Glasses Shop, Furniture Store, Wall Store, Candles Store, Hightech Store, Gift Shop, Electronics shop and all kinds of marketplace business that needs a feature rich and beautiful presence online. Venus Sun Style Store Responsive / Multiple Purpose Magento Theme is built on Venus framework version 2.0 and bootstrap version 3.0 to make fully responsive theme that works perfect on all kind of resolutions as well for mobile, tablet, desktop having medium and large screen. With powered by the framework the theme support you many great tools to customize theme via using Live Theme Editor, Auto loading custom css files support you creating unlimited of theme profiles without code very easy and simple. The Magento Template included three skin colors, great Slideshow Module having many Animation JQuery Effect, Google Fonts, Power Mega mneu Module having great design Make Mega Column Tool and many other nice modules. Item Reviewed: Ves Sunstyle New Responsive Multipurpose Magento Theme 9 out of 10 based on 10 ratings. 9 user reviews.